Forget South by Southwest, forget the Austin city limits music festival, its all about the BatFest baby. Arrived in Austin on Greyhound today. Have been looking forward to Austin for sometime. Hostel is nice and by a lake although it had a dodgy shower set up, not that I mind but don't want to make the other boys feel inferior with my assets. Walked the two miles into town. 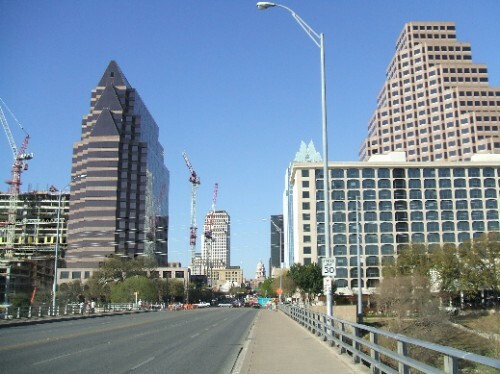 Austin is a nice city, pretty and clean. Has a rock vibe about it which is what we were hoping. Checked out 6th street which we have heard is great. Took a walk and came across something called the Batfest on a cardoned off bridge. 5 dollars to get in. Two stages and lots of stalls. At dusk everyday 1.5 million bats swarm out from under the bridge. Take away the decimal point and the million and you have the actual figure. Had a couple of beers on 6th street after but nothing heavy and headed back. Probably have a proper night out tomorrow, most places in the USA seem quite busy on Sundays. Think we can rent bieks and kayaks from hostel so will probably do that at some point. Quite tired today from all the travelling but we have four days booked here so will be able to catch up. Travelling is getting to be a doddle, we had up to Austin booked back in Florida and has been smooth sailing. Will start to figure rest of route out next couple of days and book rest of Texas and New Mexico.